Home » When to use a Diaphragm Seal ? When to use a Diaphragm Seal ? Process measurement sensors are not indestructible. Not even the most rugged device is fully immune to the chemical nature of process media or the kinetic impact associated with fluid composition and movement. Balancing degrees of protection, usually to increase the useful life of the device, with sensor response and accuracy is a frequent challenge in the process measurement and control field. Industrial processes commonly are associated with corrosive or toxic fluids, often at extreme pressure or temperature and containing various levels of solids. Any of these traits can pose substantial risk to process performance and uptime. Operations that process fluids will employ pressure measurement devices to monitor process performance and maintain system safety levels. There are many instances where characteristics of the process and its media are not compatible with pressure measurement devices. Corrosive media that will prematurely deteriorate the pressure sensing element. Viscous or fibrous media, also those that may crystallize or polymerize, posing a risk of clogging channels, tubes, and orifices of pressure measurement devices. Media temperature that is beyond the rated range for the pressure measurement device has a potential to damage the instrument or cause error in the pressure reading. A measuring point that is remotely located from where a technician may need to observe the reading. Also conceivable, the pressure measurement device needs to be located away from other potentially damaging environmental conditions. The process requirements dictate specific hygienic requirements that are cause for the measurement device to be isolated from the medium. Toxic or otherwise hazardous media that must be contained. Excursions of system pressure may exceed the acceptable range of the instrument, potentially damaging the device. 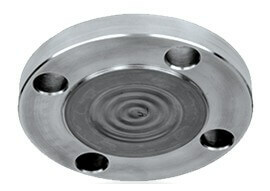 A solution which can provide protection from the items listed above, while still maintaining instrument response and accuracy is a diaphragm seal. Seals are placed between the pressure measurement device and the process media. The space between the diaphragm, which is flexible, and the sensor is filled with a fluid that will hydraulically transfer the pressure condition on the process side of the diaphragm to the sensor. The diaphragm serves as a physical barrier between the potentially damaging media and the instrument. Diaphragm seals are available in a wide variety of configurations to accommodate any media type or connection requirement. Seal selection involves specifying the connections and form factor to properly mate the diaphragm with the instrument and the process, then selecting the diaphragm material that will be compatible with the media. The best way to achieve a positive solution is to share your requirements with a qualified assembler. 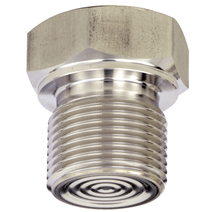 They can help select the right diaphragm seal and mate it up with a pressure gauge, providing a complete assembly that is ready to be installed in your process.